Really, it’s a funny funny movie with some AWESOME lines. Seriously, you NEED to see this movie, like, NOW if you haven’t already. Classic lines, deliciously creative insults, THIS is a brilliant movie. 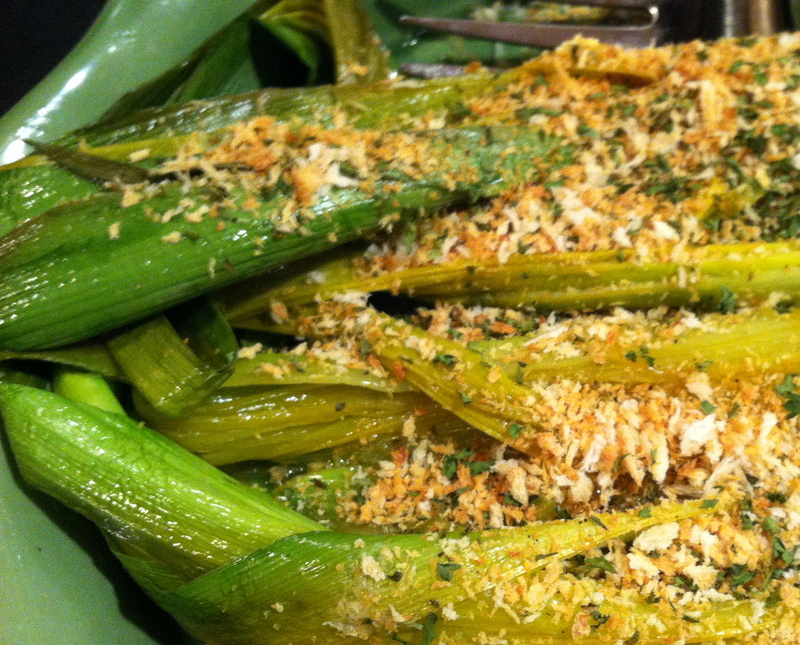 Here’s my version of Brick’s famous line: I Love LEEKS! Go ahead. Yep. Go ahead and say it. I already know I’m lame. For dinner tonight we had Broiled Rib Eye Steaks, Buttery Braised Leeks with a Crispy Panko Topping and what was supposed to be Smashed Red Potatoes (they turned into something more along the lines of really lumpy mashed potatoes). This was a lovely lovely meal. 2 bone-in Rib Eyes, about 1″ thick **Let your steaks come to room temperature before cooking them (about 1 hour) – it helps ensure you won’t burn the outside before cooking the inside. 1- Put either a cast iron skillet or an oven-proof skillet about 4″ below the broiler and crank that bad boy up. Let the pan heat up for at least 10 minutes. 2- Rinse and pat your steak dry. Let them air dry while the skillet is heating up. If you’re using NON-KOSHER steaks, you should salt and pepper both sides now (Kosher meats come salted, so no need!). 2 Tablespoons Margarine **Feel free to use butter or olive oil or duck fat or whatever you have on hand. 1- Dump cleaned potatoes into a saucepan. Cover with water, and in the salt and boil boil boil. 2- You test a potato’s doneness by taking it outta the water and cutting it open. Is it crunchy or soft in the middle? You want soft. Drain your done potatoes. 3- Dump yer taters back in the pot. 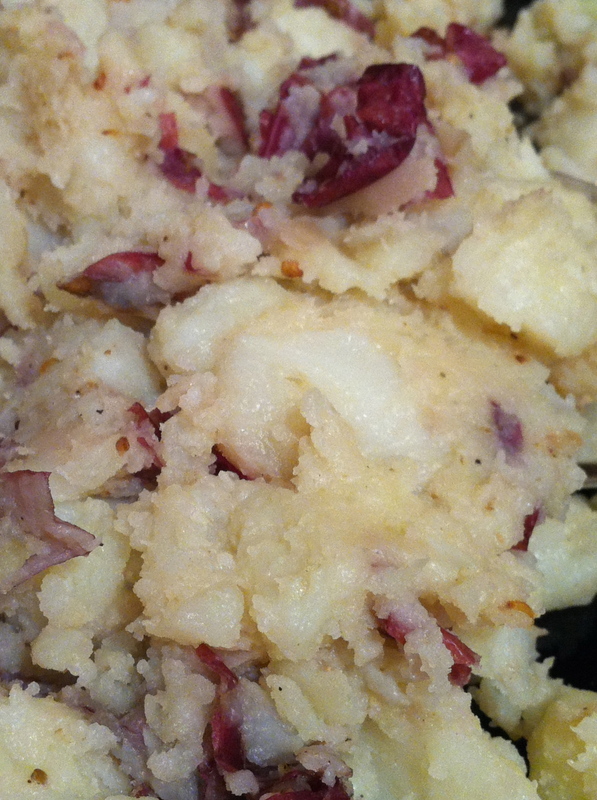 Using either a large fork or a potato masher, smash your tater’s a little til they break apart, but aren’t all mushed up. Drop in the margarine, salt, pepper and coriander. Gently stir together over a medium/low heat until all are mixed in. Taste to see if you need more salt or pepper or margarine. 4- Try not to eat it all yourself. 2 Tablespoons grated Parmesan **I omitted because we were having a meat meal tonight = non-dairy! 1 Tablespoon Butter **I used non-dairy margarine. Feel free to double the oil if you’d like to omit the butter. 1- Combine panko, parsley, parmesan (if using), salt and pepper. 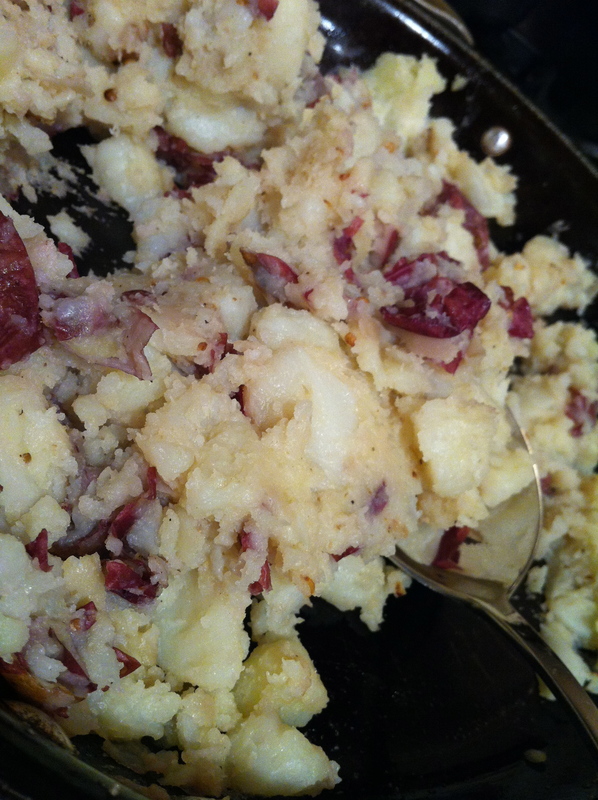 Toast them in a dry skillet over medium heat until the mixture is golden brown. 2- Melt the butter/margarine and olive oil over a medium-high flame in a large sauté pan. 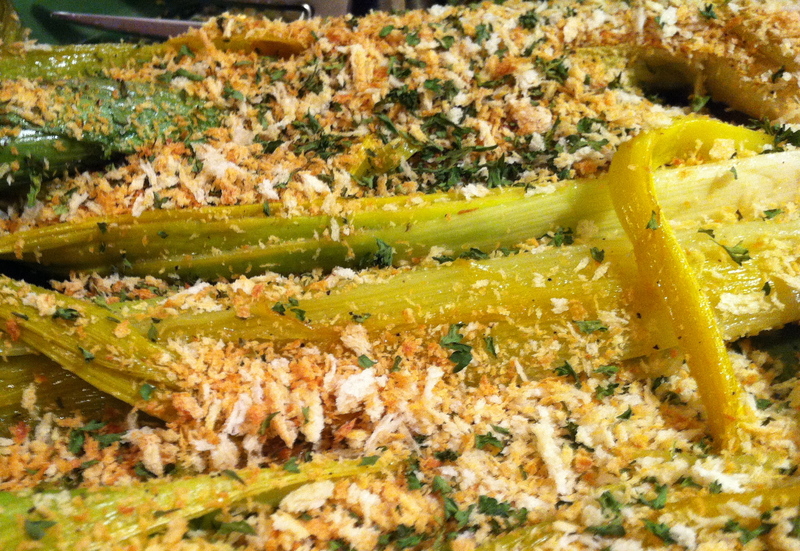 Once hot, place the leeks cut side down in the pan. Let cook for 4-5 minutes. Carefully flip the leeks over and turn the heat down to low. Cover (I used an upside down baking sheet to cover the big pan) and let the leeks braise for 25-30 minutes, until the leeks are soft all the way through. 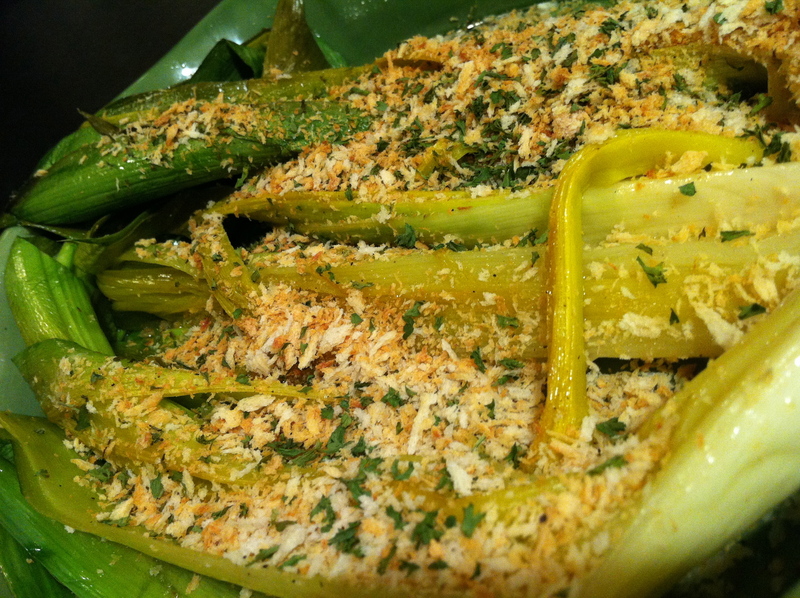 3- Take the leeks off the heat and drizzle with the lemon juice. Top with the crunchy crunchy panko mix and serve! 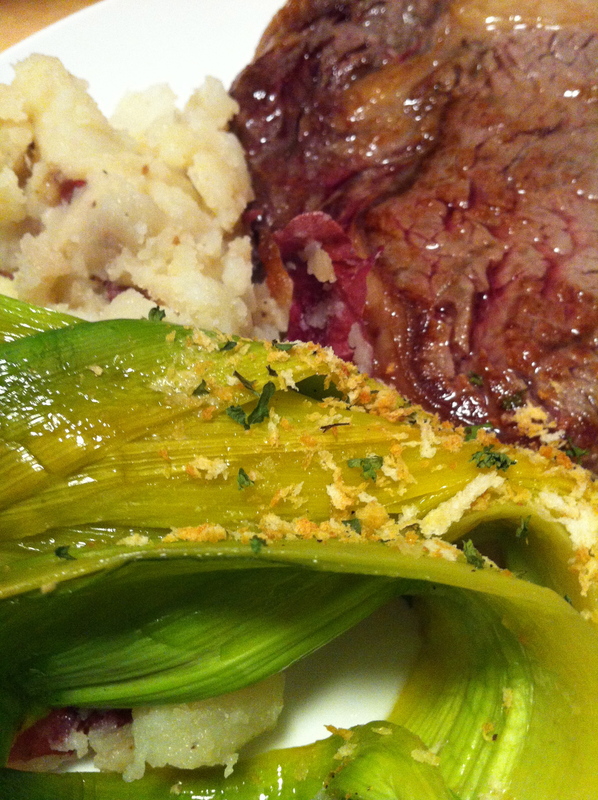 C really liked the leeks and asked where the recipe came from. I think I may have been too busy licking my plate clean to answer him. I’ve only ever watched this on DVD or on cable – if you happen to catch it, I *def* think its worth your time! 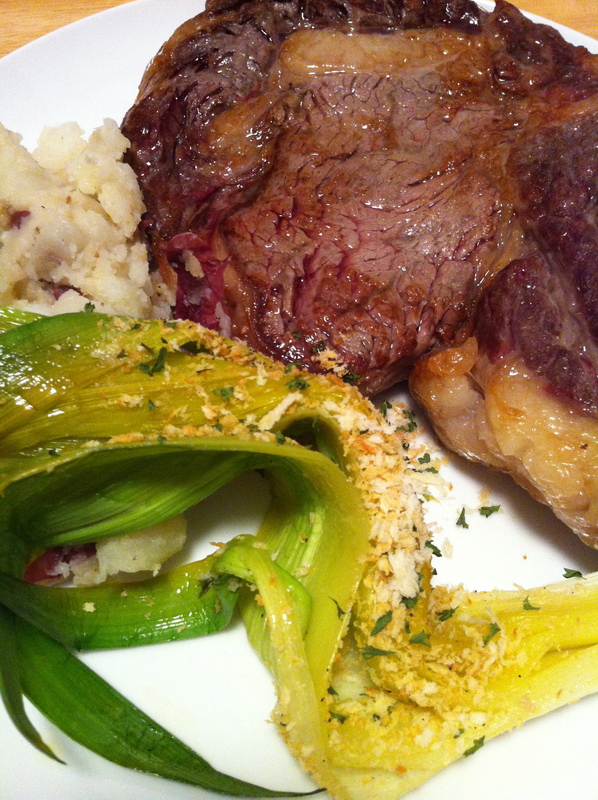 Btw – broiled steak on cold snowy nights is WHERE.ITS.AT!